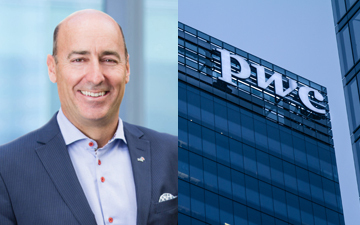 Toronto, April 4, 2018 – PwC Canada has named Nicolas Marcoux, FCPA, FCA, as its new chief executive officer, beginning July 1, 2018. Marcoux began his career with PwC in 1989 and is currently national managing partner, Montréal office, Major Cities, and Consulting and Deals at PwC. He will succeed Bill McFarland, who has served as CEO of PwC Canada since 2011. The accounting firm had a strong 2017, as PwC Canada led the Big Four in public client gains and losses, with a net gain of seven new public audit clients for 2017, according to SEDAR analysis provided to Canadian Accountant by Audit Analytics. Of the 20 new public clients added overall by PwC in 2017, the largest by market capitalization was the Canadian subsidiary of Progressive Waste Solutions, rebranded in 2017 as Waste Connections of Canada, at $11.5 billion. Marcoux has served a wide range of clients and industries as a corporate finance partner and the lead relationship partner on many of the firm’s key clients. A specialist in mergers and acquisitions, Marcoux is “very familiar with the various intricacies of a transaction,” according to PwC. “Nicolas has a lot of experience dealing with private equity firms in Canada and throughout North America.” The Montreal native has carried out more than 100 transactions over the past 20 years, assisting in mid-market public and private companies with acquisitions, divestitures and raising capital. “Nicolas is an exceptional leader who has the passion and vision to lead our clients and firm into the future. He has a track record of engaging and inspiring teams to seize opportunities and innovate, and is passionate about the success our clients, people and communities,” says Bill McFarland, CEO & chief inclusion officer. A graduate of the University of Sherbrooke with a Bachelor of Business Administration, Marcoux holds the corporate finance (CF) designation. He is a board member of Orchestre Symphonique de Montréal and Youth in Mind Foundation. Colin Ellis managing editor of Canadian Accountant. With files provided by PwC Canada. Composite image, PwC Canada and iStock.